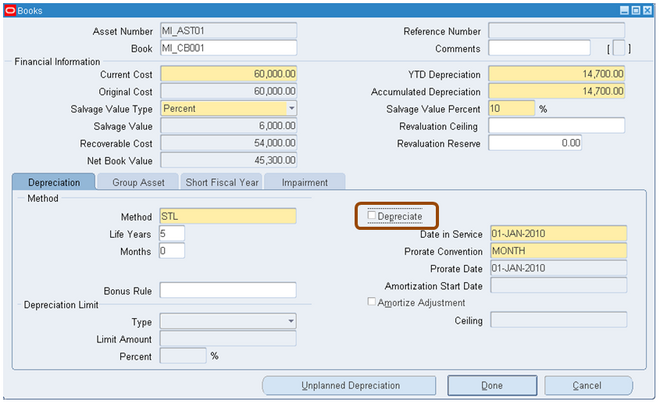 You can suspend depreciation by unchecking Depreciate in the Books window. If you suspend depreciation of an asset when you add the asset, Oracle Assets expenses the missed depreciation in the period you start depreciating the asset. 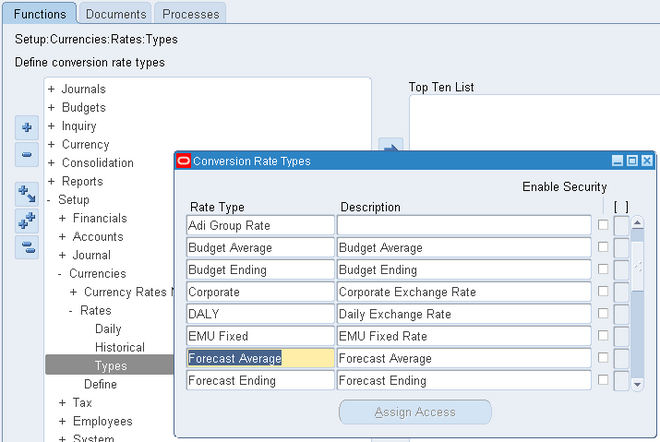 For table and calculated methods, Oracle Assets calculates depreciation expense for the asset based on an asset life that includes the periods you did not depreciate it. 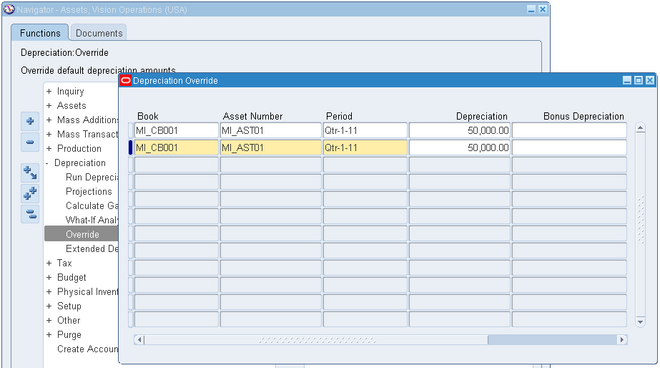 If you suspend depreciation after an asset has started depreciating, Oracle Assets catches up the missed depreciation expense in the last period of life. Run the depreciation program independently for each of your depreciation books. 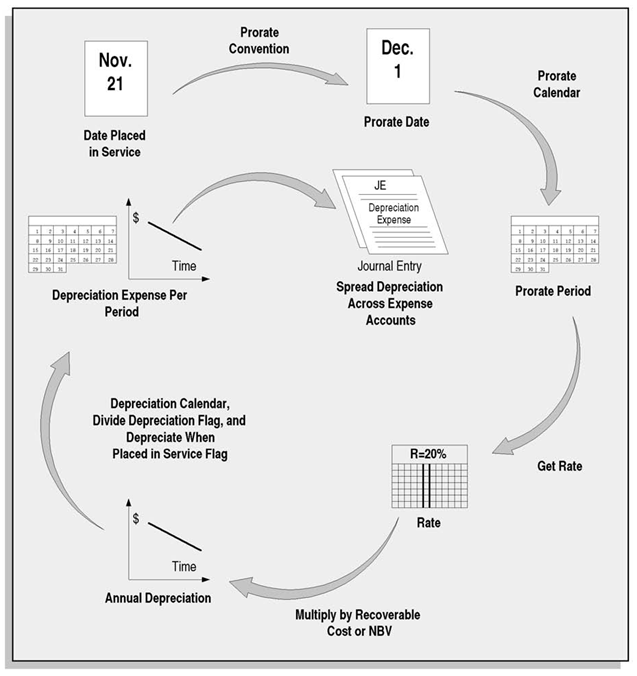 The depreciation program calculates depreciation expense and adjustments, and updates the accumulated depreciation and year–to–date depreciation. If you have run depreciation for a particular period, you can use the Rollback Depreciation feature to restore assets to their state prior to running depreciation. For example, you may have outstanding adjustments or transactions that you need to process for a period. However, you have already run depreciation for that period. If the Close Period check box was not checked when you ran depreciation, you can roll back depreciation to include these outstanding transactions. Once material is consolidated, it is ready for further processing such as packing, shipping, or loading. It is essential that you know the status of consolidated material so you can make a decision on what material is eligible for further processing. • All lines in the From and To LPN, if the material resides in an existing LPN, must be assigned to a delivery. • The destination LPN must be in a locator of type Staging. Consolidation is the process of bringing material from various parts of the warehouse together for the purpose of packing and shipping. 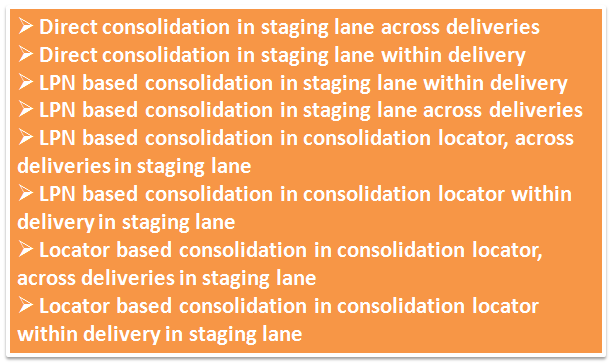 Consolidation can occur at one or more points during the outbound flow of material. Most warehouses perform consolidation of picked material so it can be packed prior to shipment. Some warehouses perform subsequent consolidations such as building pallets of packed items and then shipping the pallets. 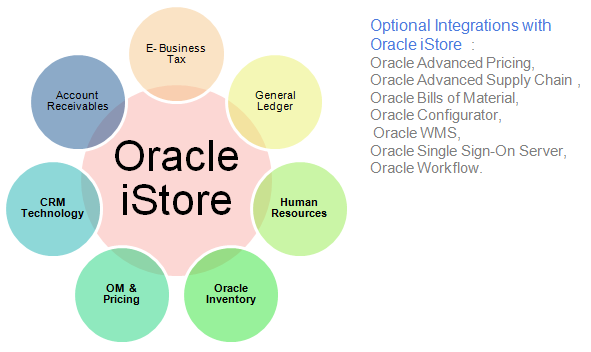 Oracle iStore integrates with many other Oracle applications to provide and extend its functionality; therefore, a large portion of your implementation will involve understanding, setting up, and maintaining the integrating applications. iStore's dependencies and integrations range from those applications that supply an underlying structure for your sites to those that extend its functionality and capabilities. 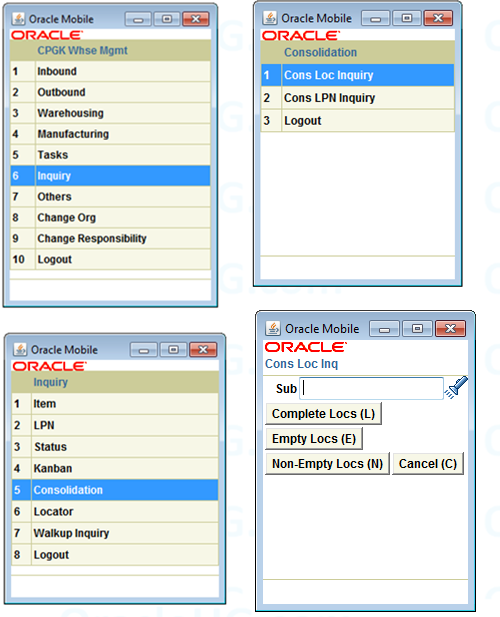 The applications that provide structure are mandatory, while ones that enhance Oracle iStore are optional integrations. 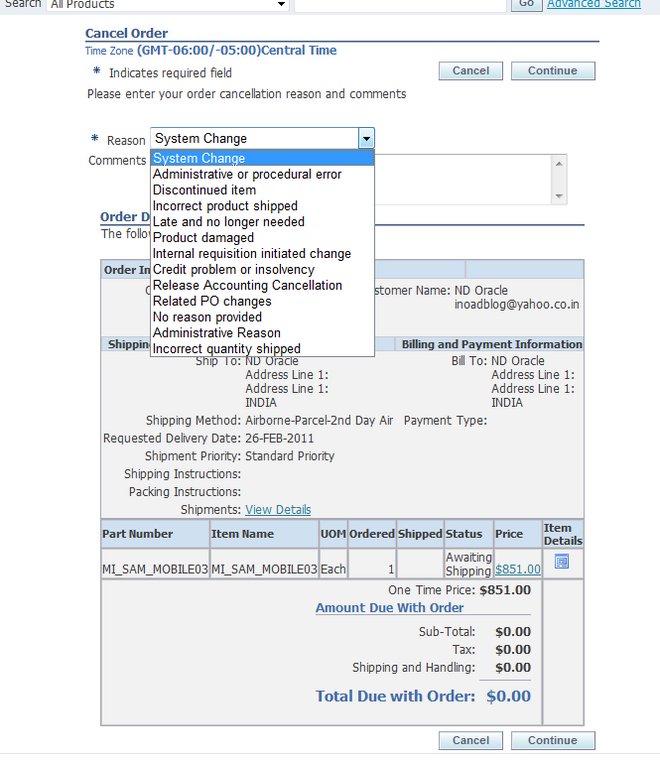 Oracle iStore allows B2B and B2C users to cancel orders that they have placed in the Customer Application, if the orders are in Booked or Entered status in Oracle Order Management. B2B customers also can cancel orders across organizations.